You know that I’m not a big chain restaurant girl… I avoid them whenever possible. But sometimes, you know, you just have to go. In R’s futile attempt at finding an appropriate party outfit for our holiday party on Friday (yes, I know, it’s way past the holidays), we had to appease my growling stomach, and stopped in on ye old Cheesecake Factory. Guess what folks? If you go on a weeknight at 9:30, you don’t have to wait for a table. Voila! Free bread. Nothing wrong with that. Also, it was really nice out (near 70 degrees), so we both got smoothies. 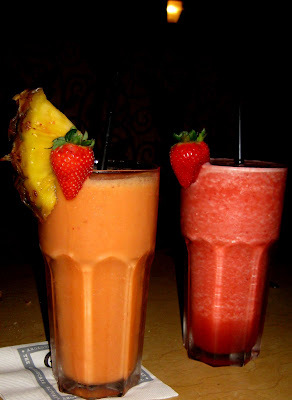 R’s was strawberry, mine was tropical, both were ginormous. It pretty much became my meal. My belly was full by the time the entrees came out, which really didn’t take very long. How do they cook these meals so quick? Especially considering they have umpteen-thousand items on their menu. 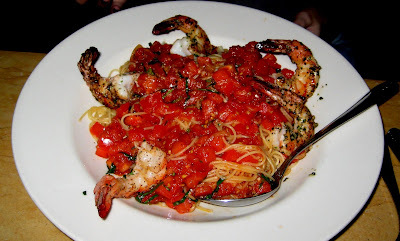 R got shrimp with angel hair pasta. As usual with most Cheesecake Factory food, ginormous. And look at those shrimp – they’re the size of my hand. I went with the spicy chicken chipotle pasta. Again, giant plate, giant heaping of food. I barely made a dent in this. Luckily, I got to eat it for two additional meals. And even more luckily, I liked it. It had super sweet and fresh peas and asparagus, both favorites of mine. If you’re gonna put veggies in pasta, I’d vote for either of those any day. 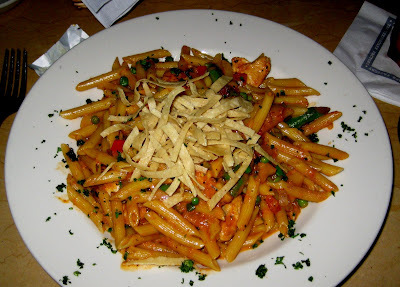 The pasta was also good and cooked well, the chipotle sauce spicy, but not too spicy. The chicken was a little dry and bland, and I wouldn’t have minded if there was no chicken in this at all. I do still have issue with the portions at this place. You could just half the portion and the price, and I don’t think anyone would mind. But you know, as is with everything else in America, everything just keeps getting bigger and bigger. But I can’t pretend that I don’t like their food. It is actually pretty good for the most part, even though I’d always pick a non-chain place first! And no, we were too stuffed to get cheesecake! there ain’t no shame in likin’ shames, i like the factory too :-) it’s been years since i’ve visited, but i loved the pad thai and evelyn’s pasta.